It's cranberry season! 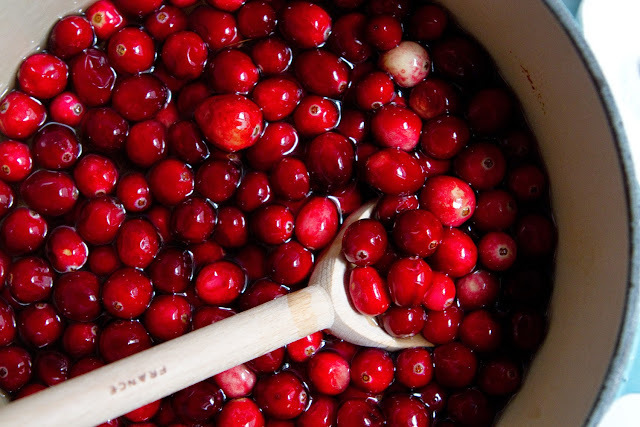 I live just across the Hudson river from a major cranberry producing state- New Jersey. I've expounded before on the beauty and wonder that is rural New Jersey, but there are so many wonderful things that I forgot to mention the cranberry bogs. S and I love to camp in the New Jersey Pine Barrens. In the summer we tube the Wading River and in fall and spring we hike the sandy roads to check out ruins, abandoned railroad bridges, fire towers, and cranberry bogs. There are bogs right in the state park, owned by farmers who grow for Ocean Spray. S and I have even sampled wild cranberries- never from the commercial bogs, but we've each tried one found growing alongside the river. They were bitter, like all raw cranberries, but also lovely and crisp. There is just something special about eating wild foraged fruits, even if it's only one or two berries. 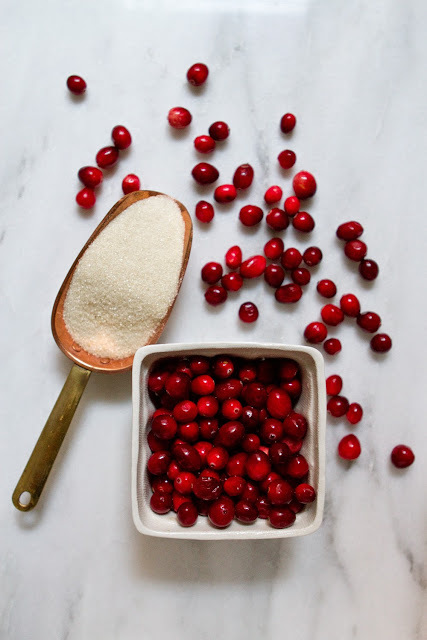 I like many different cranberries preparations, cranberry sauce, orange cranberry relish (my favorite part of Thanksgiving as a child), tart cranberry pie, but these sugared cranberries may be my all time favorite preparation. They're both sweet and tart, juicy and crisp, and the sparkling sugar topping makes them absolutely lovely to behold. 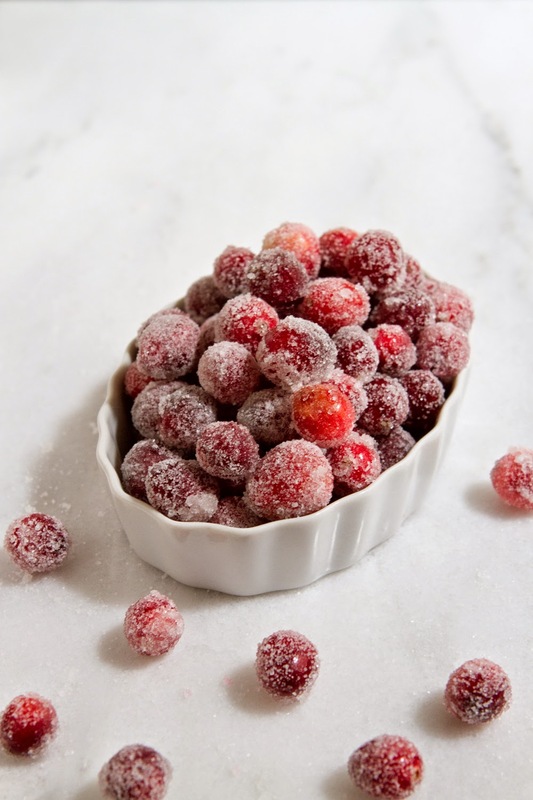 Not to mention when you get a cranberry candied at the peak of ripeness and you bite into it, it makes this amazing pop noise, audible from several feet away, which is just too fun. 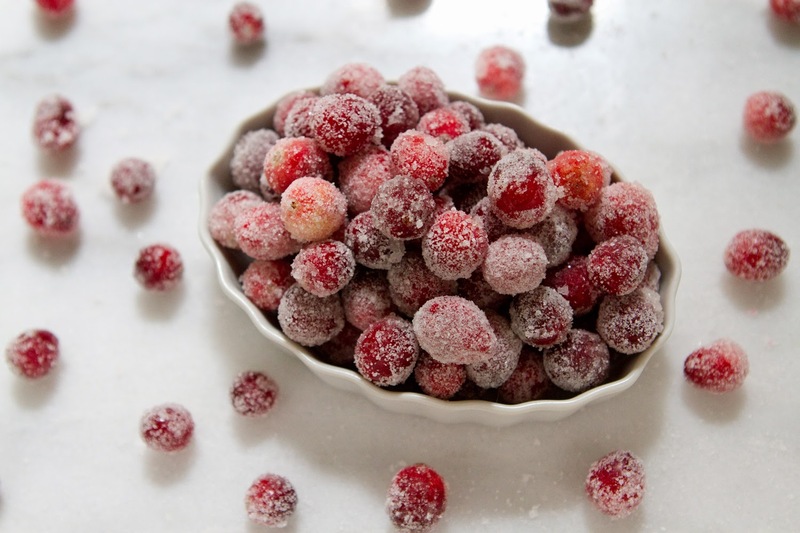 The popping cranberries are definitely the tastiest, too. These berries are so beautiful, they look a bit like they've been covered in snow or frost, so they seem like a magical pairing for this nippy fall weather. At first they'll seem too pretty to eat, but after you have one you won't be able to stop. They're the most addicting thing in my kitchen right now, more addicting than the Ben & Jerry's Candy Bar Pie ice cream in my freezer. It's good, but I'd sooner eat a whole truckload of these berry delights. These are too beautiful to eat only as a snack though, they would be lovely on a spread of hors d'oeuvres, perhaps served with a cheese plate, or on a lavish dessert buffet. Or you could skewer them with a toothpick to use as a fancy-schmancy cocktail garnish. Or package the sugared berries up in cute boxes and give them as Christmas gifts- my aunt did this one year and I'm pretty sure I ate them all on Christmas Eve. 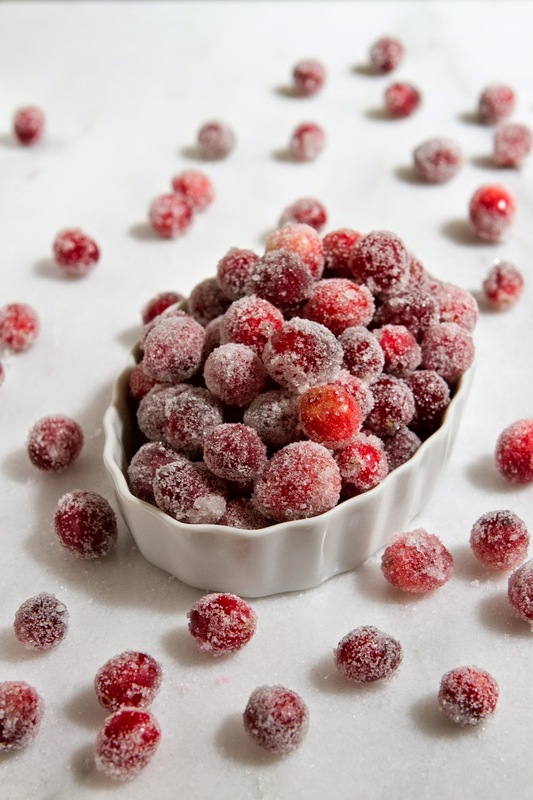 Any way you serve them, these beautiful sugared cranberries will be a wild success. First, a note on sugar: any type of white sugar will work for the syrup, but the type you use for coating the berries at the end will impact the way they look. A very fine sugar, such a sanding sugar will give the berries a very light, thoroughly coated white look, I think of it as looking like frost in the morning. I used plain domino cane sugar which gives a more crystallized, snowy candied look. A larger grain cane sugar, such as whole foods cane sugar tends to look clumpy. Pour the water into a medium sized saucepan, add 1 C sugar, and heat over medium low, stirring occasionally, until all the sugar is completely dissolved. Remove from heat and allow to cool about 10 minutes. 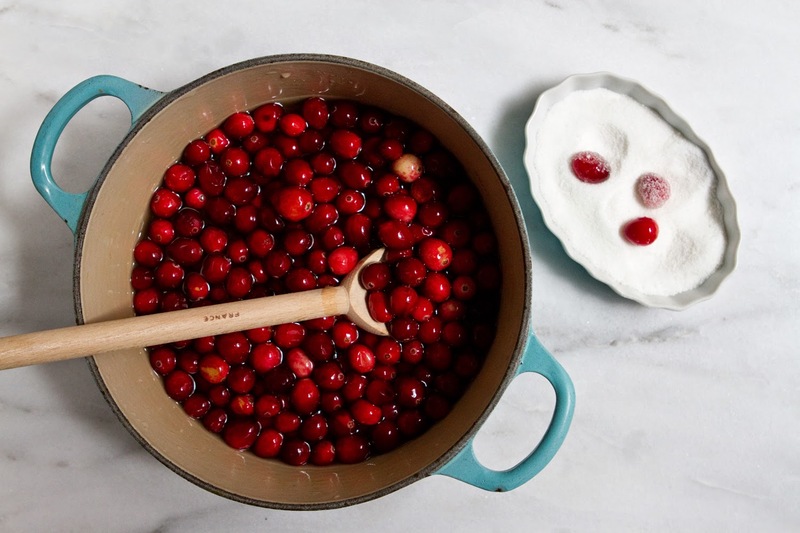 Once syrup is warm, but not too hot to touch, add the cranberries. Add just 3-4 at first, and stir them around gently. If any split open, wait a few more moments for the syrup to cool, but if they remain in tact, add the rest of the cranberries and give them a gentle stir. Make sure they're all getting wet. If there is space in your refrigerator, just pop a lid on the sauce pan and put the whole thing in the fridge. Otherwise, pour berries and all syrup into a tupperware with a lid, and refrigerate overnight, or at least 6-8 hours. 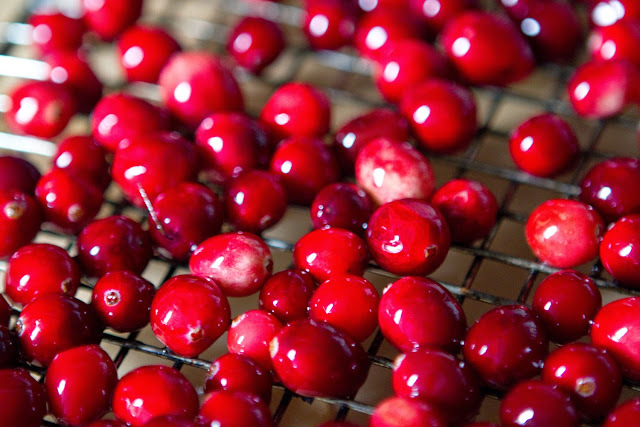 After refrigeration, use a slotted spoon to transfer the berries to a cooling rack (I put parchment paper under mine to catch the syrup drips), and allow to dry for 20-40 minutes. 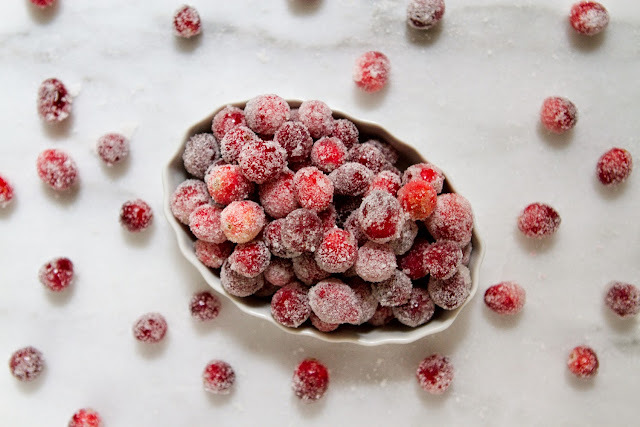 Once berries have dried a bit (they'll still be sticky and slightly damp- this is fine), place the remaining 1/2 C sugar in a shallow dish, and add the berries, a few at a time, tossing them gently with the sugar so they're entirely coated. Return coated berries to the cooling rack. If your sugar begins to clump, run it through a fine strainer placed over a bowl, and use what sifts through. 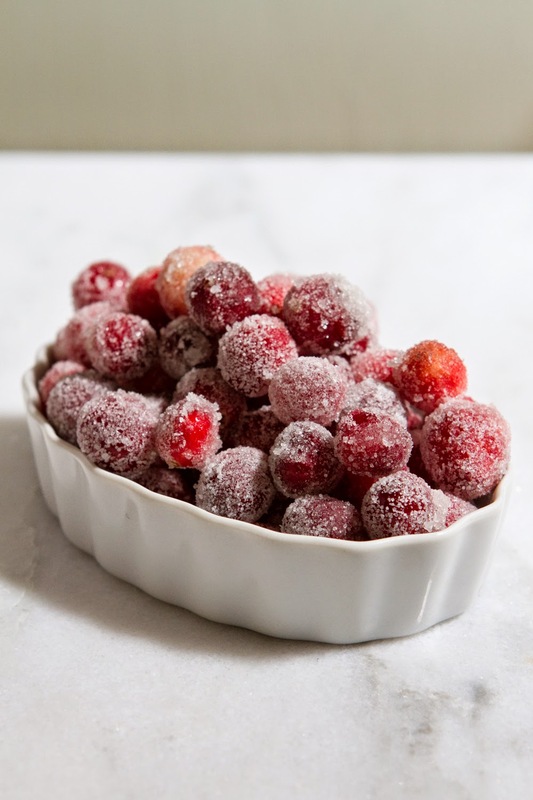 Once all berries are coated, give them another 20 minutes or so to fully set up, then pop them in a dish and serve, or in a tupperware and store in the fridge until you need them. They'll keep around 4-5 days, but I promise they won't last that long, they're addicting! 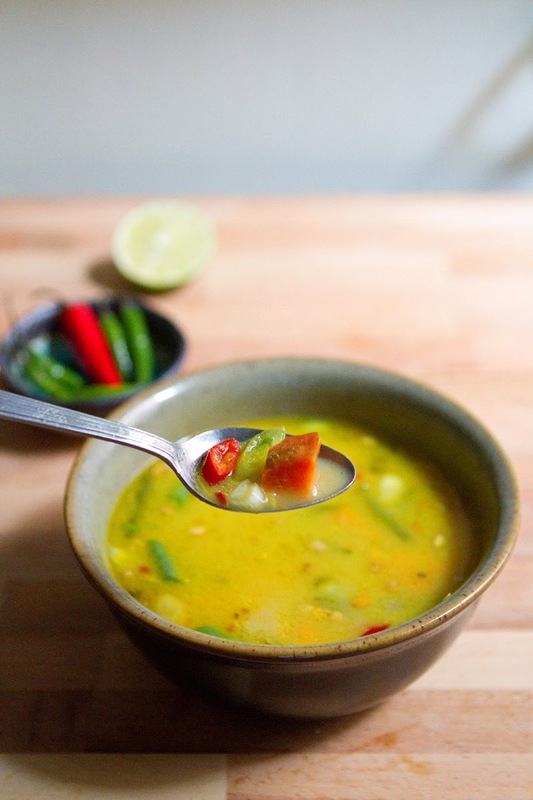 Tom Kha Gai, or spicy coconut soup, is one of my favorite dishes in Thai cuisine. I love the creamy, gingery, limey broth with soft pieces of onion and tender boiled chicken, it's so warm and invigorating. 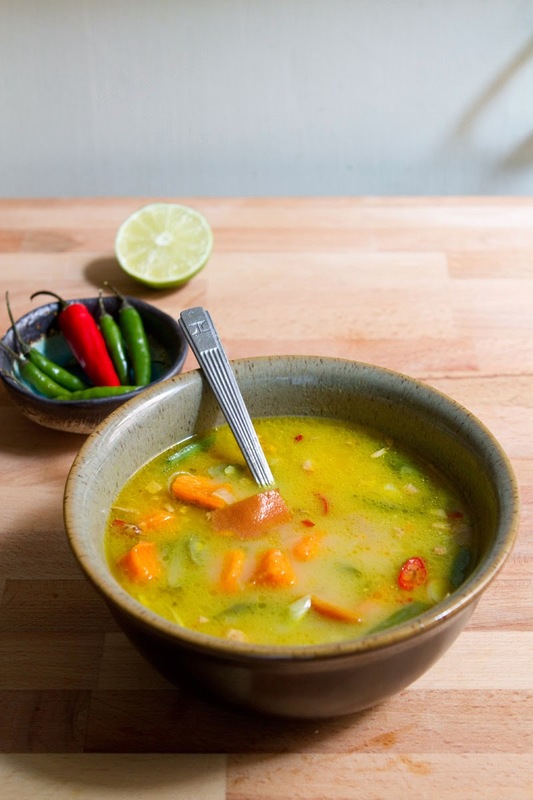 For this soup I wanted to incorporate some of my favorite Tom Kha Gai elements into a heartier, more filling soup, perfect for brisk autumn evenings. I swapped the (usually rather sparse) chicken out for plentiful chunks of bright orange sweet potato, added some green beans, and spiced it up a bit with extra chillies and a bit of curry powder. 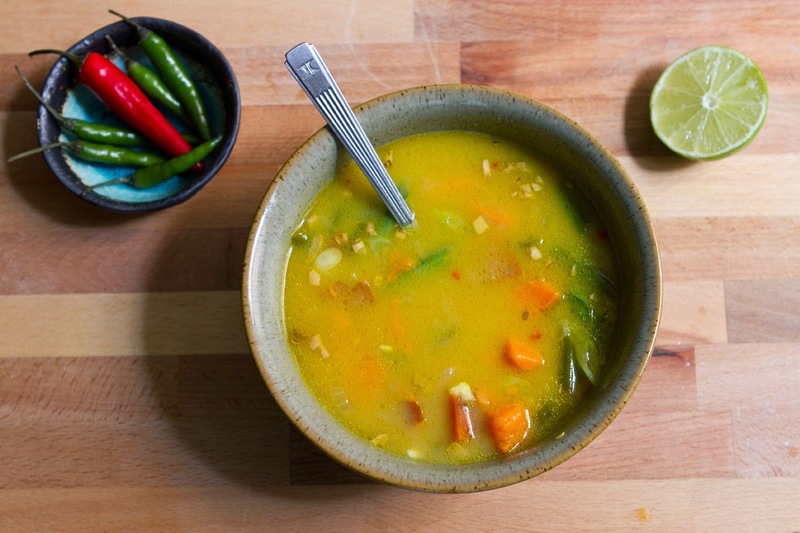 I love sweet potato in soup, it becomes so soft and luscious, and it soaks up all the delightful coconut milk and spices. You begin this recipe by softening the onions together with the chillies, ginger, and garlic- and the smell of them all sizzling away is just phenomenal. 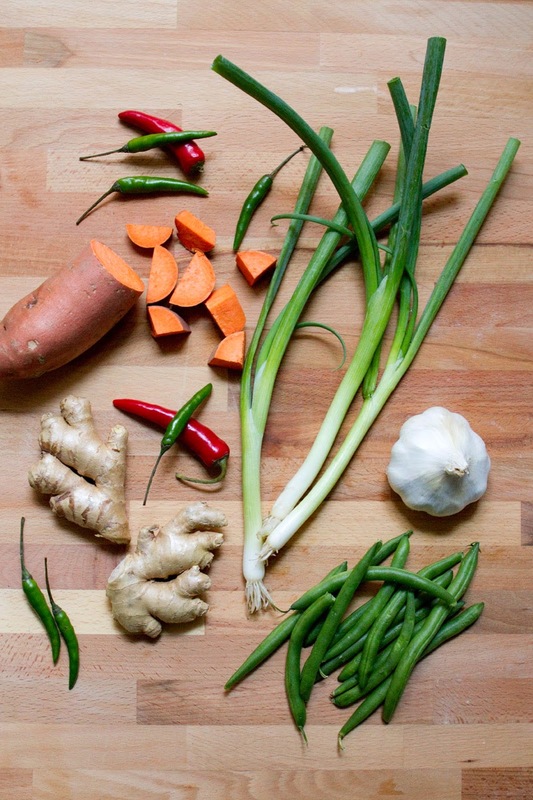 That sharp ginger-onion-chili spice wafts out of the pan and fills the kitchen, reminding me of Balinese sambal sauce, which is made from coconut vinegar, chillies, ginger, and shallots. If I close my eyes and breathe in over this pot, I can almost imagine I'm reclining in a pondok, surrounded by rice paddies, drinking a Bintang and munching on crispy fried duck. Ahh, Bali is heaven. If you can't find a pondok surrounded by rice paddies, this soup is a pretty great runner up in terms of heavenly experiences. I've been running every day for the past week, and after an especially windy and chilly jog this is the perfect soup to come home to. From the first sip you can feel its warmth spreading from your core out through your sore, tired, cold extremities, all the way to your finger tips and your toes. 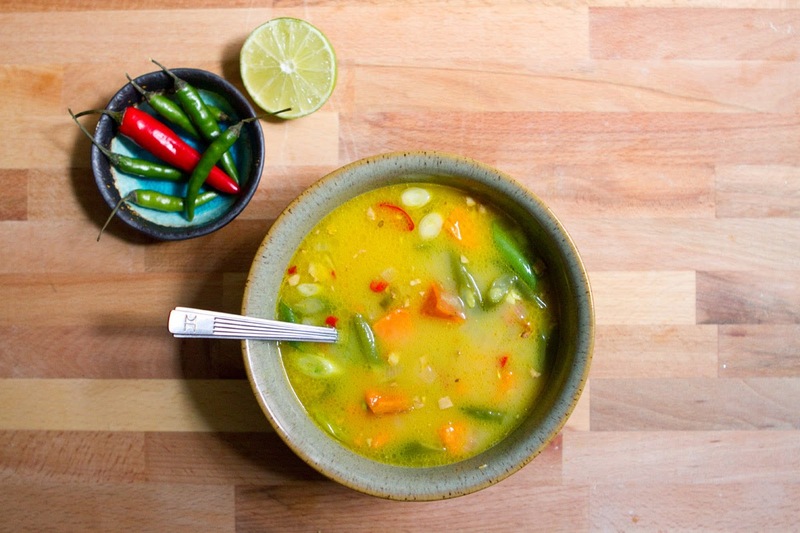 The chillies add the perfect twist of spice that becomes a slow burn the more you eat, and the ginger adds a lovely zippiness. 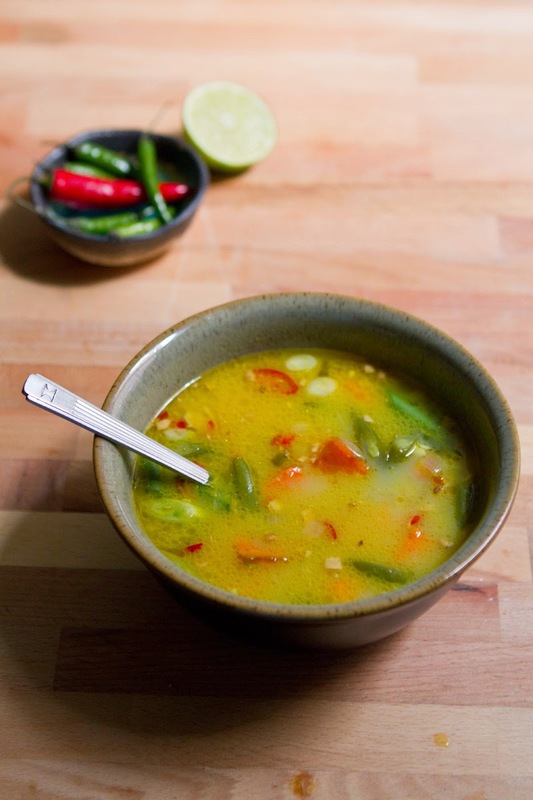 This is a fantastic dinner or lunch soup, no need to make any sides, a big bowl of this is a whole meal. It comes together quickly, making a great weeknight meal, and it'll fill you up, and warm you from head to toe! In a large, heavy pot pour 1 tbsp of olive oil, and add the chopped onions and minced peppers. Cook over medium heat, stirring often, for 2-3 minutes, until onion begins to soften. Add the minced garlic and cook another 3-4 minutes, until onions are soft and translucent and the garlic is fragrant. Add the grated ginger, stir well, then add the sweet potatoes, followed by the curry powder and fish sauce. Stir well to coat potatoes in curry and fish sauce, then add the chicken broth, and coconut milk. Squeeze the juice of 1/2 a lime in, then bring to a boil. 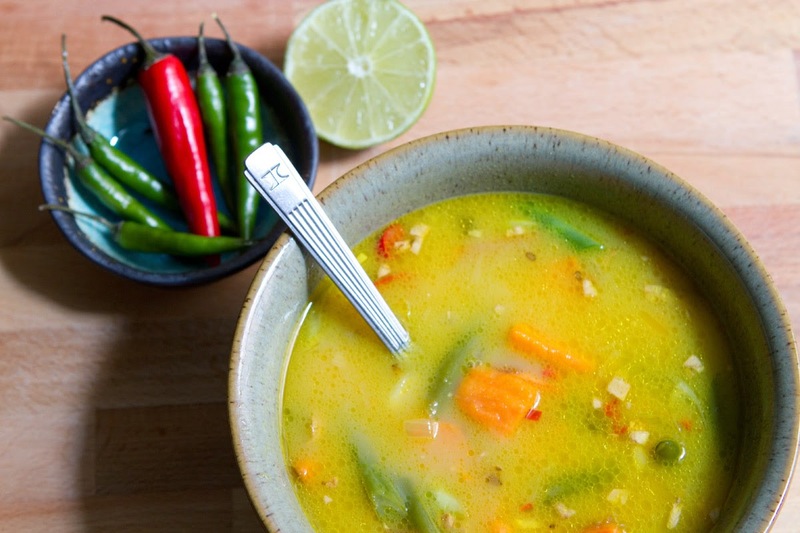 Once the soup is boiling, reduce the heat to medium-low, and cook 5-8 minutes. Add the green beans and continue to cook until green beans and potato are soft and ready to eat, about 10 more minutes. While the soup cooks, thinly slice the white and light green parts of the scallions. 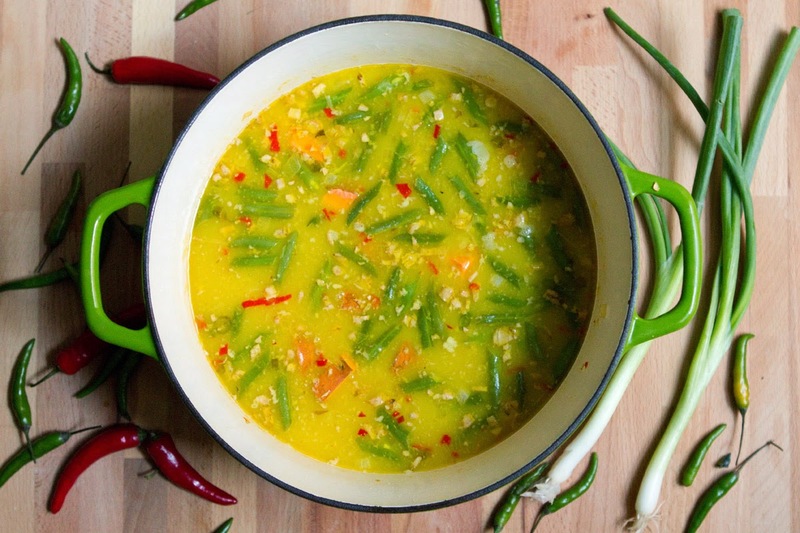 Once potato and green beans are soft, remove soup from heat and ladle into bowls. Top each bowl with freshly sliced scallion, and any remaining sliced chilies. Enjoy!